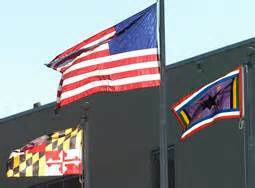 This flag was created in 1991 by David Harvey (1965-2002) and his wife Tonya (nee Ivory), residents of Baltimore, MD. 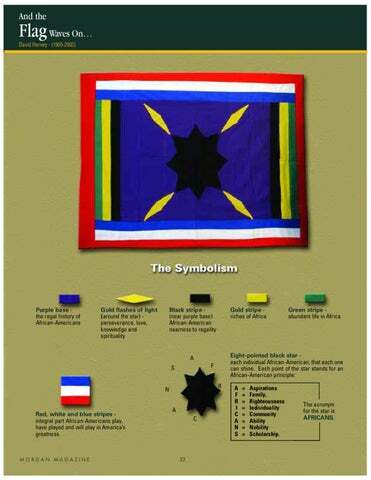 Their intention was to make a flag which would represent the African-American population as a whole, not being related to any political movement. The flags have been being produced and sold by DATON, Inc., a company founded by the Harveys, and were quickly accepted by a number of institutions, such as the Morgan State University (from which the Harveys have both graduated), National Black Catholic Congress, and many others, but David Harvey's early death seems to have slowed down the spreading of the flag a great deal. Purple base - symbolizes the regal history of African-Americans. Gold flashes of light around the star - symbolizes perseverance, love, knowledge and spirituality. Black stripe (near purple base) - symbolizes African-American nearness to regality. Green stripe - symbolizes abundant life in Africa. Gold Stripe - symbolizes the riches of Africa. Red, white and blue stripes - symbolize the integral part African-Americans play, have played, and will play in America's greatness. The acronym for the star is AFRICANS.